Since our beginnings, we have looked around us for materials we could manipulate to fill our needs and further our development. The shaping of wood and fiber into objects that reflect our place in this world has been a central part of human life. How can one look to these artifacts to tell our story without considering the maker? It is only through their eyes that we can understand the traditions, values and technology of their time. While we continue to develop, the artists of Mind Over Matter: Donna Anderson, Emily Barletta, Erik and Martin Demaine, Jessica Drenk, Christopher Kurtz and Polly Adams Sutton still turn to these materials and methods. 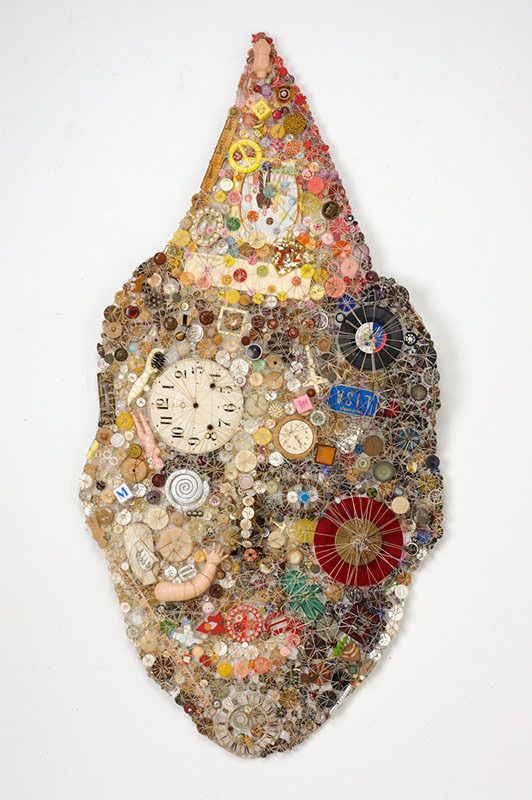 But how do these artists and materials tell our current story? The Demaines have an extraordinary story. In the 1970s, after studying in England, Martin opened the first one-man glass studio in Canada. Work from Demaine Studio is considered part of the international studio glass movement and included in major museums. Martin has been called the father of Canadian glass. Erik was homeschooled by Martin. One could say the first collaboration between father and son was in 1987, when Erik was only six. The Erik and Dad Puzzle Company distributed 3-D, mathematically-based puzzles throughout Canada. Martin never received any degrees beyond his high school diploma, but Erik swiftly climbed the ranks of academia and at age 20 was made the youngest-ever professor hired by the Massachusetts Institute of Technology, a post which he currently holds. He received a MacArthur Fellowship as a “computational geometer tackling and solving difficult problems related to folding and bending—moving readily between the theoretical and the playful, with a keen eye to revealing the former in the latter.” Martin is now an instructor at the MIT Glass Lab and is the Angelika and Barton Weller MIT artist-in-residence. Examples of the Demaine’s mathematical origami resides in the permanent collection of the Museum of Modern Art, New York as well as the Renwick Gallery in the Smithsonian. 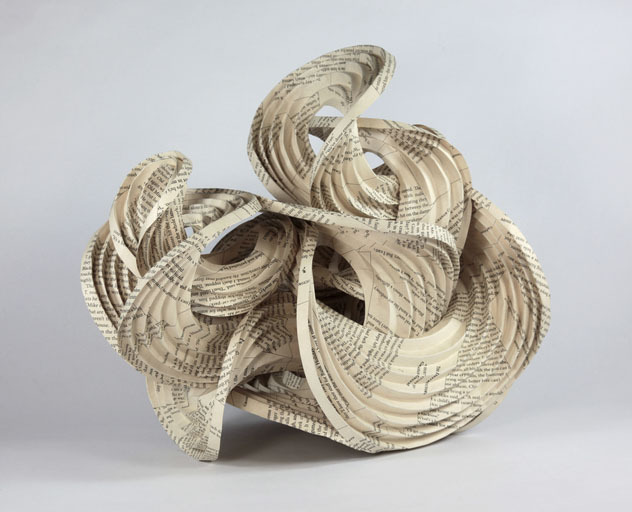 Their scientific work includes over 60 published joint papers, including several about combining mathematics and art. They recently won a Guggenheim Fellowship (2013) for exploring the folding of materials such as hot glass. Martin and Erik are also featured in the movie Between the Folds, a documentary on modern origami. Through her process, artist Jessica Drenk examines how we classify the world around us and makes a connection between the man-made and the natural. The manufactured materials she chooses resonate with their natural origins, an affect that is multiplied when one considers the meaning encrypted in her organic forms. In Cerebral Mapping, Drenk cuts thin strips from books, entwines them and coats them with wax. The resulting wall installation resembles the lichens that may have grown on the trees from which the books were made. But one can also imagine the thin strips as neurons, excited by the ideas once shared in the books before they were restructured. Drenk approaches the themes of information and language from a different direction in Tesselation 3. Here wood is cut, broken and reassembled forming tablets that distinctly resemble some sort of binary language, leaving us to guess what message might be encoded into this natural material. Drenk has an MFA in 3D Art from the University of Arizona. Her work has been pictured in Sculpture, Interior Design, and Curve magazines, as well as The Workshop Guide to Ceramics. Her work has recently become a part of the Fidelity art collection and the Yale University Art Gallery. Drenk’s home and studio are currently in Florida. Christopher Kurtz wears two hats. He is a furniture maker, creating thoughtful, refined and functional designs that sit comfortably in the home. He is also a sculptor whose forms, though abstract, are technically informed by the history of furniture making and engage the viewer in a conversation about art and craft in a mechanized world. His three works in Mind Over Matter illustrate his approach. The 19th century “Birdcage Windsor” was on object of fascination early in the artist’s career. For the artist, this reproduction piece created in 2003 had the potential to generate endless forms. The twisted (A) Typical Windsor turns the icon on its ear, relieving it of its function, but not of the complex woodworking techniques of carving, steam bending and lathe turning. Kite takes the viewer further along on Kurtz’s exploration- its structure completely abstract yet still familiar. Kurtz studied sculpture at the Kansas City Art Institute, Landscape Architecture at The GSD at Harvard University (Career Discovery Program) and received a BFA in sculpture from The New York State College of Ceramics at Alfred University in Alfred, New York. 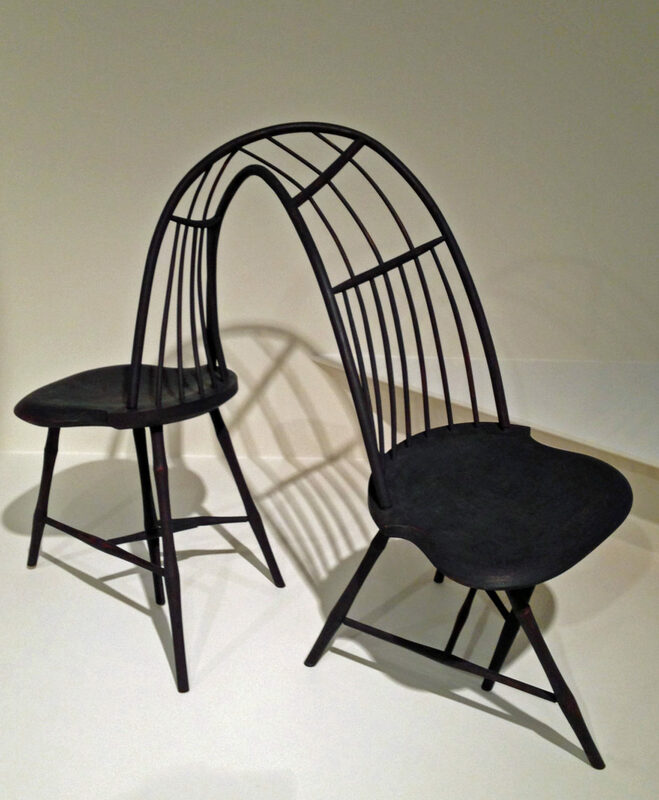 After college, Kurtz refined his woodworking skills while assisting Martin Puryear in his studio. He has received numerous grants and awards, including the prestigious Louis Comfort Tiffany Award in ‘05, and in ’07 he received a New York Foundation for the Arts (NYFA) Award (Lily Auchincloss Fellow). Lisa Kokin’s earliest memories are of playing on mountains of foam rubber in her parent’s upholstery shop. She came to sewing early and soon found it a way to express herself. In her richly conceived work, thread is not only a material but an idea, stitching together a matrix of memory. The experiences she records can deal with larger socio-political themes but are always distinctly personal. In her Facsimile series, she transcribed pages from books that she inherited from her grandfather. While randomly choosing pages to “copy” in thread she came about (to her dismay) a passage in Walt Whitman’s Leaves of Grass in which Whitman helps a friend conduct a slave auction. The ensuing piece, Paradox, is displayed with the transparent thread “pages” hung from a single nail, the drape rendering the text unreadable. In Record (Light to Dark) the viewer cannot ignore the obsessive quality of Kokin’s work. The text, “Take me home now” is taken from her mother’s last words. The color of the thread resembles those of her mother’s fragile bruised skin. The spiral created by the repeated phrase looks like a record that may have played in Kokin’s head after her mother’s death. Kokin holds a Master of Fine Arts with High Distinction from the California College of the Arts and has taught at several colleges and universities including the San Francisco Art Institute and the University of California. Her work is included in numerous private and public collections including those of Yale University Art Museum and Tiffany & Co.
Brooklyn based Emily Barletta creates colorful formal abstractions by taking a needle to paper rather than to cloth. The stitches accumulate, like mark making, creating drawings that ask the viewer to contemplate each stitch as an individual element and also the composition as a whole. For Barletta, the act of pulling the thread through the delicate paper serves a dual function; it records the passage of time in the sometimes disturbing world around her while creating a mental space that allows her to create delicate worlds of her own. 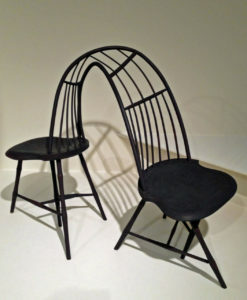 Polly Adams Sutton does not abandon functionality or traditional basket making techniques in pursuit of the undulating sculptural forms that she creates. In fact, she embraces them, harvesting her own raw materials from logging operations of Western Red Cedar trees- but only with permission. In the spring, when the sap is running up from the roots, she splits off coils of bark which are then dried, seasoned, re-soaked, split and cut for each piece. This malleable material is a cornerstone of her work. Sutton starts each basket with no preconceived notion of the finished piece. The process itself, the weaving of the piece, influences its ultimate form. “When the cedar is damp it bends like leather so it is a matter of controlling the tension where I see the potential for a good curve. It is important to constantly assess the overall shape so there is balance in the asymmetry.” says Sutton. Sutton’s work appears on the cover of 500 Baskets: A Celebration of the Basketmaker’s Art, part of the popular “500” series by Lark Books. Her work can be found in several permanent collections, including those of the Museum of Fine Arts, Boston and the Arizona State University Art Museum. She holds a Master of Arts, Art Education, from Michigan State University. 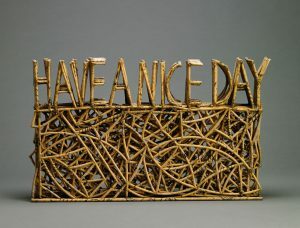 One cannot help but smile when first seeing Have A Nice Day. 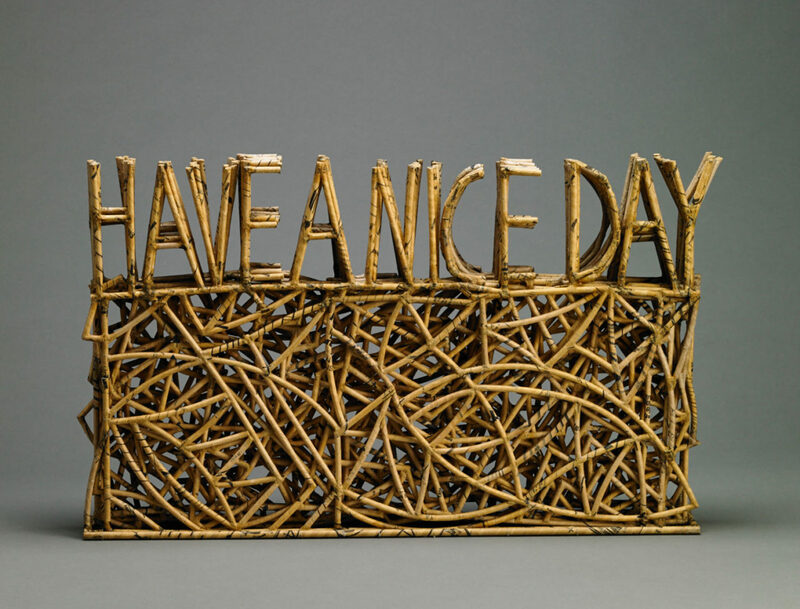 The popular and banal farewell is embedded in the pattern formed by the reeds used to construct the piece. “Our environment works on us in a silent way. The finished artwork is what matters. The process by which it evolves is a good teacher. Life flows through us and eventually into our artwork our thoughts are revealed.” says Anderson. She became an artist under the tutelage of Everett Community College instructor Russell Day, who mentored such noted Northwest artists as Chuck Close and Dale Chihuly. Her reputation has subtly gone national, earning her places in galleries and exhibits throughout the U.S. Visitors to Mind Over Matter will be greeted by the Veiled Portal. The site specific installation, featuring hand dyed and embellished fabrics, was created as a collaboration by the members of the Tampa Bay Surface Design Guild. The purpose of the guild is to increase community awareness of surface design and its value in our lives.